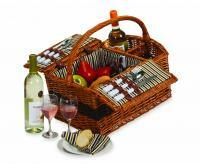 Willow picnic basket with deluxe for 2. With cotton lining and made of willow sea-grass and wood chip,this new shape basket is the ideal gift for any occasions. • 1 Tablecloth (cotton 34"" x 34"")"
I bought this basket to replace our old one to take on fishing/road trips. I was pleased with the quality of the basket and contents for the price. We haven't used it yet but it appears to be sturdy, quality made and nice looking. The only complaint I have, as an other review stated, the emblem on the front of the basket is not attached straight. This isn't a huge deal, though with the rest of the basket looking so nice, it is a little annoying with that little attention to detail that would have made this about perfect. 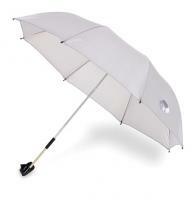 It was the perfect wedding gift for a couple of beach goers! They loved it and everyone else who saw it thought it was the coolest ever. Was as nice when received as it was in the photo. This basket was very attractive and I was impressed with the items inside. A great size for 2 people. My daughter loved it! I bought it as a gift for a wedding. it was a big success. I bought this picnic basket as a wedding gift for a couple who enjoy the outdoors. The basket and the contents are of a high standard. The basket is beautiful, so I didn't bother wrapping it. I just put a nice bow on it and placed the card and a bottle of wine inside. It made a unique wedding gift and is already a cherished gift of the couple. I bought this product for my girlfriend for Christmas. The service I received was incredible, and I got it in a fraction of the time I had expected. The basket is very well made, and a gorgeous style. I greatly appreciated everything about this order! Basket is exceptional. I am very pleased. We were very happy with the basket we chose. We gave it to my 26 year old daughter for her birthday with items for "Breakfast in Bed" with her husband. The only flaw was 2 pepper shakers with "P" on top and no "S" for salt. We pre-filled them so we noticed, attention to detail was missed. I love my picnic basket! The quality is excellent as well as all the accessories. I even received it earlier than expected. I was very satisfied and will, surely, order from your website again. Thanks! I bought this for a wedding shower gift and it was an instant hit! The quality is outstanding. The wicker is rich and sturdy, the leather strap offers easy handling and it even has a removable leather shoulder strap. The accessories are all compact and coordinated. The domed lid gives extra space which is nice since it is truly only big enough for two. Only wish the glasses were wine glasses. It is nice to give as a gift. Honestly, it makes a nice presentation plus it is worth the price of 60-65 dollars. It would be nicer still if the leather like clasp holders were real leather. The napkins are very simple plus basic but serve the purpose. The company gets 5 stars from me for its prompt and accurate information, personal attention to my requests, and for going above and beyond in getting me the gift I wanted to buy as quickly as possible! It was a gift, but they liked it a lot. 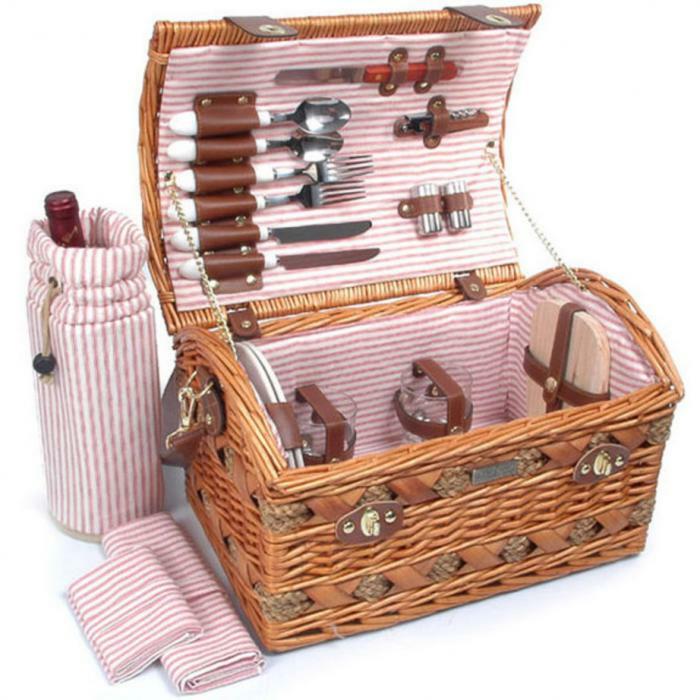 The picnic basket is beautiful and the service from your website was outstanding. My only suggestion would be to make the basket larger. With all the items that are in the basket there isn,t much room to add some personel items that I am sure most familys would have. The basket was very nicely made and we are quite satisfied with the design and structure. We were giving this item as a gift and we decided to replaced the table cloth and napkins. The buckle on one side of the basket broke after the first use. The product is not good quality.